The study presents, analyzes and assesses the views of Bulgarian philosophers on the essence of philosophy. It covers the period from the late 19th to the early 21st century. The issue of “what is philosophy” became the focus of disputes during 19th century when it turned out that different notions of philosophy coexist in the cultural space. The first Bulgarian professors of philosophy – Ivan Georgov and Krustyo Krustev drew the attention to this problem at the end of the century. Hence a topic emerged in the Bulgarian philosophical literature linked with the names of other prominent Bulgarian philosophers of the first half of the 20th century namely Dimitar Mihalchev, Spiridon Kazandjiev and Dimitar Penov. The views of the Bulgarian philosophers on philosophy over that period are discussed in Part I of this study. Part II of the study covers the post World War II period. At the outset of the communist dictatorship in this country the concept of philosophy lost its profound meaning and was practically replaced by the concept of Marxist-Leninist philosophy. Thereby the problem of the essence of philosophy was rendered meaningless and the course of a semicentennial tradition was cut off. The interest of the Bulgarian philosophers in this topic was gradually renewed on a historic-philosophical basis. (Mihail Buchvarov). Numerous publications were released during the 1980s whereby some of them (those of Lyuben Sivilov and Valentin Stanoev) contain comprehensive concepts of the essence of philosophy. After the fall of the authoritarian regime in Bulgaria the Bulgarian philosophers have expressed their opinion on philosophy in articles published in our philosophy journals. These are dwelt upon at the end of Part II of this study. The relation „logicism – psychologism” is a main topic in the Bulgarian philosophical tradition. Its source, originating from the early Michalchev’s works, is the critique of the theory of images, respectively of psychologism, representationism, and the vindication of the idea of radical antipsychologism, i.e. presentationism. The debate „logicism – psychologism” is specific generative schematism, which is constantly reproducing itself. It is thematized through the prism of new philosophical themes and problem fields. The tradition, related to the development of presentationism and to the critique of representative realism, outlines one of the lines of continuum in Bulgarian history of philosophy during 20th century. The article gives a broad overview on some of the main scientific debates in Bulgaria in the 20th century. Instead of scrutinizing in detail the whole spectrum of different views on science the article presents few case studies marking this way the main biases in the given period. The period is divided in two parts – from the early years of the century to 1947 and from 1947 to 1989. The most important debates in the first period are in the fields of psychology on the scientific status of psychoanalysis; biology and sociology on racism; and in the field of philosophy itself on the very nature of science. Concerning the second period the article gives an account of the political influence on science. The period is marked by the debates in genetics and physics. The article is part of a wider study of philosophy of science in our country; it presents the basic aspects of the debates conducted in the specific field of philosophy of psychology. The text is put separately because of the specific character of psychology itself compared with the rest natural sciences. account continues by outlining philosophical-anthropological themes in the period from the late 1940s till the early 1990s, a time when the academic discipline “philosophical anthropology” was considered unnecessary. Finally, the present day great variety of philosophical-anthropological studies is commented on. The paper aims at tracing the “birth”, the inculcation and the various vicissitudes of ethics in the modern history of Bulgaria. The text is divided into three parts following the pattern of the social, political and cultural developments of Bulgaria: from the Liberation to 1944; from 1944 to 1989; and from 1989 up to now. The paper is an attempt at reasoning upon one of the significant aspects of the Bulgarian adherence to the values of modern Europe carried into effect at the end of 19th century and during the first half of 20th century: the reception of moral values by means of philosophical-ethical education. The essential moments of this process outline the contours of a pattern that has already successfully been applied, on the one hand, and of a pattern that could be advantageous in the new ongoing reintegration of the country into United Europe. The essay focuses on the development of the philosophical-historical thought viewed through the dialogical fields of the long and dramatic “Bulgarian 20th century”. The thematization unfolds through applying a typological approach in analyzing the cultural-historical creations. The accent is put on the explication of the historiological projects that energised at the level of ideas the activism of the Bulgarian society in its transition to modernity up to the present day. The discussions about the theory of historical knowledge and the specificity of Geisteswissenschaften are presented together with the attempts at a philosophical reception of the Bulgarian history. The paper marks also the main philosophical-historical debates in the age of socialism initiated by the problems of social practice. The selected bibliography includes authors and titles that really took part in the development of the philosophical-historical culture in Bulgaria during the studied period. This work focuses on the interpretations of the Bulgarian philosophers and historians of philosophy pertaining to the research field of the history of philosophy. Attention is drawn to the philosophical points developed throughout the 20th century. During the first part of the century notable landmarks are the concepts of the Bulgarian philosopher Krustyo Krustev, Ivan Georgov, Dimitar Mihalchev etc. These concepts refer to the effort to find a common language between philosophers and to provide grounds for a successful dialog. During the period from 1944 to 1989 the discussions main goal was to outline the Bulgarian philosophical tradition and to defi ne the subject and the timeline of the history of the Bulgarian philosophy. The views of Karakolov, Buchvarov, Stoev etc. pertain to this period are analyzed. Some discussion topics after 1989 are also touched on, even though they are sporadic and never clearly defi ned in an open discussion. These are mainly related to the national identity of the Bulgarian philosophy. Views in this area are represented by Dimitar Tsatsov, Latyo Latev, Atanas Stamatov, Dobrin Todorov, Iassen Zahariev, Georgi Kapriev. This text represents a maximum number of points of view, “voices”, standpoints, concepts and debates (actual and by correspondence) between the representatives of different aesthetic currents thus hoping to focus upon and lay down the main debatable fields during 20th and 21st century, forming up the „many-tongued” picture of the Bulgarian aesthetic thought throughout that period. This study does not aim at acquiring a full restoration of this picture, but rather intends to mark off a network of „important places”, which is open to other, future „readings” and interpretations. That is why the exposition is synthesized – descriptive and lacking (as far as this is possible) any prejudice and reestimations. The text deals with the specific problems of the philosophy of religion(propositions concerning the essence and existence of God, religious language, the relations between “religion and science” and religion and philosophy), as well as the distinction between philosophy of religion and religious philosophy – all these are very real problems, which arose in the Bulgarian cultural area in 20th century. The stress is on the variety of views in the first half of the century – after that period this area of problems became permissible only for theologians, while the philosophy of religion assumed the form of “scientific atheism”. Finally the contemporary trends in the development of philosophy of religion in our country are outlined, and the more important studies in this field are highlighted. The text represents a brief history of the Bulgarian school of philosophical mediaeval studies, as it includes the specific social and cultural environment, in which the school is formed, the growth of the community in Bulgaria and within the international research of the mediaeval philosophy. The text is focused not only on the work of the school – translations, issues, critic texts, conferences, projects, teaching – but also on its two main characteristics: the condition, that the mediaeval philosophy is studied in its own philosophical and cultural value, and the fact, that the school implements a “mediative translation” between the two great cultural spheres within Mediaeval Christian Europe – the eastern Byzantine and the western Latin philosophical and cultural traditions. Analytic philosophy has never been a homogenous unity, but more a method of thinking that created a commonality of topics, types of philosophical questions and logic of affiliation to a discrete philosophical tradition. The reception of analytic philosophy in Bulgaria was mediated by several pivotal figures and events before and after1990. The paper analyses their contribution and the areas of philosophical investigations but also the reasons for its staggering growth and alienation as well as the shortcomings of the restraints and bias towards its ‘alleged’ theoretical minutiae of philosophical focus. Fuelled by the expansion and opening of university philosophy after 1990, though more from a history of philosophy perspective, it is far from the state of notified end. It offers some of the most relevant lessons to be learned from philosophy in twentieth century that permeate with undeluded steadiness what constitutes philosophy in Bulgaria. The paper aims at presenting a particular scholarly initiative – a series of international theoretical conferences named Sofia Dialogues. Since 1996 within the framework of the conferences was elaborated by the forum initiators and organizers Ivaylo Znepolski and Heinz Wissman and includes the personal participation of influential figures in the area of philosophy and humanities (François Furet, Juergen Habermas, Jacques Derrida, Umberto Eco, Charles Taylor, etc.) and also publishing the conference proceedings in Bulgarian and in the language of the prominent guest. The paper analyzes the way in which the conferences are diagnosing the present-day Bulgarian social, political and cultural condition. The following diagnosis has been drawn from the forum proceedings: it is a condition of an atomized, demoralized, disintegrated society, incapable of generating shared visions about the past and of formulating long-term goals for the future, hardly demonstrating interest in its own theoretical self-knowledge. 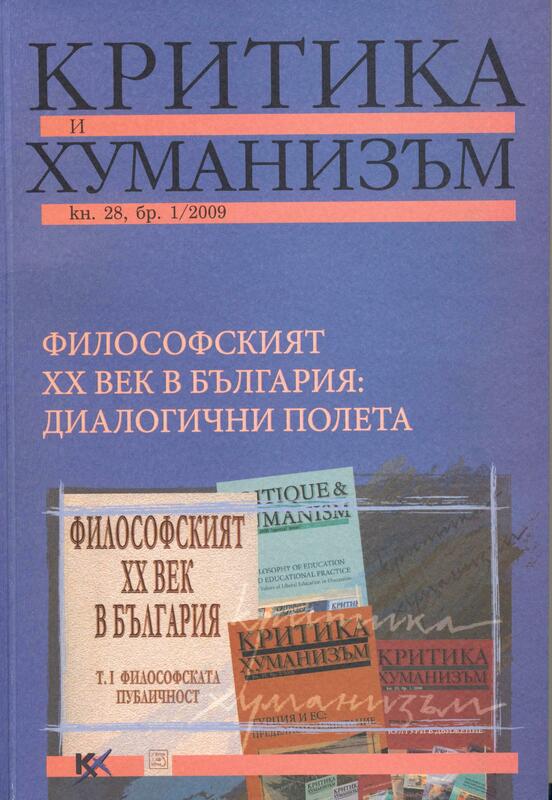 The paper analyzes the ideas and the life-work of the late lamented professor Mihail Buchvarov (1929-1997), one of the few Bulgarian philosophers with the rare skill to build, maintain and unostentatiously direct the activities of research teams including persons otherwise quite different in their mentalities and styles of behaviour. It is supposed that Buchvarov not only realized a number of his own studies some of which are considered matchless even today but also managed to formulate and inaugurate the realization of a detailed agenda for a gradual and thoroughgoing study in the history of the Bulgarian philosophical culture. Such an agenda requires scrutiny of all that might be considered at least relatively valuable among the works of those Bulgarians who got in touch with philosophizing. And even if it was not manifested as a rigorous project with definite executives and concrete deadlines, this agenda is still being implemented by a wide circle of Buchvarov’s followers. The realization of this open-ended project is already joined by scholars who had no direct contacts with the initiator but who belong to the “invisible” and uninstitutionalized and yet really functioning community of those who share the belief in the significance of the agenda inherited from Buchvarov. Main engines in the realization of this project are his disciples – people whose dissertations were advised by him and who then became his colleagues. “High post-communism” in eastern Europe is defined by efforts to control collective memory, political discourse dominated by abstract concepts, and the cult of entertainment – a view from Lithuania. Cultural and political life in Lithuania is marked by what Homi K. Bhabha, speaking of postcolonial nations, called “ironic compromise”. The Lithuanian is “almost a European but not quite”. Consumerism grounded in indebtedness means financial dependence as opposed to democratic freedom. In the consumerist system, the individual who asserts him or herself through authentic freedom is regarded as a non-efficient citizen. The fact that a Guggenheim museum is being planned for Vilnius is indicative of the conviction that “de-provincialization” can only be achieved by taking part in global projects. Meanwhile, the cultural demands of the local population go unheeded. Vilnius is not Bilbao!